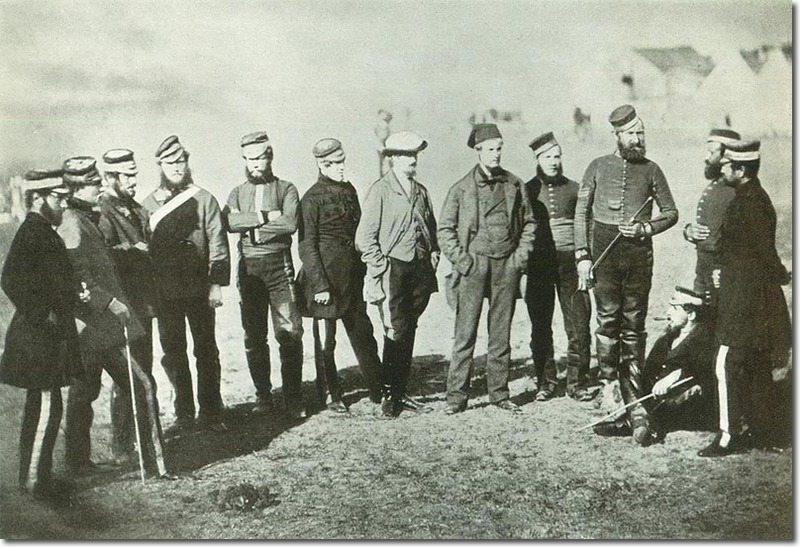 Fenton's photo of the 5th Dragoon Guards taken in 1855 shows ten officers and three Warrant Officers. The commanding officer is Captain Adolphus Burton, probably the man seated cross legged on the ground. He features in other photos taken by Fenton, in which he is in full uniform mounted on his horse. Some of the officers are in civilian or semi-civilian clothes, others are in blue frock coats or stable dress. The Sergeant-Major stands to attention near Burton. His stable jacket has embroidered cuff ornaments similar to those worn by officers on their dress tunics. The other Warrant Officers stand either side of him. He seems to be a figure of considerable authority.